Alfred was born John Alfred Cheeseman at Lympne in Kent on 9 March 1849. Four years later he emigrated with his parents and siblings to Australia where he eventually settled at Carngham in central Victoria. Carngham (a derivation of the aboriginal word 'Kurnam') had been named as a site for a township in March 1852 but remained as a virtual adjunct to Philip Russell's Carngham sheep station until after gold was discovered there in 1857. According to Hugh Anderson (1985:64-5), there were 459 Europeans in and around Carngham just prior to the gold rush including 109 children and 23 'scholars'. Of the male adults, he continued, 'one third were alluvial miners (99), and there were three squatters and twenty-seven farmers employing respectively ten and twenty-nine labourers between them. Other occupations listed are those of shopkeeper (12), butcher (7), carrier (6), and wood-splitter and fencer (5)'. As well as labouring and working in the mines, Alfred worked as a wood cutter and splitter. In this last guise it is more than likely he was employed by James Telling, Charles Nunn or one of the other fencing contractors who, during the mid- to late-1860s, put up hundreds of miles of post-and-rail fences around the runs at Carngham, Lang Willi, St Enoch's and Eurambeen. Alfred was the best man at his brother Thomas' first marriage to Annie Eliza Cobold at Carngham in September 1867. Thomas and Annie were, in turn, witnesses to Alfred's marriage to Jane Elizabeth Wright in the Church of England at Carngham on 16 May 1870. The wedding was conducted by the local minister, Samuel Walker, who signed the 'Form of Declaration' that tells us that Alfred and Jane were each 21 years old at the time of the wedding, that neither had been previously married, and they both were living at Carngham. Jane Elizabeth Wright came from Broughton in Huntingdonshire in England, the eldest daughter of John Saunders Wright who married his cousin Sarah Bodger at the nearby village of Grafham on 28 February 1848. John and Sarah and Jane emigrated to Australia in 1852 where John was contracted to work on Philip Russell's sheep station. After living for a time at Mount Cole, which was then covered with virgin forests of Messmate, Blue Gum, Manna Gum, Stringy Bark and Yellow Box, the family moved to Carngham and onto a block of land that John had bought there. According to Hugh Anderson's history of the Ripon Shire, John Wright worked for Philip Russell all of his life, initially as a carrier and then as the Carngham station overseer (a position later occupied by his oldest son Joseph Robert Wright). He died on 25 November 1888 of sanguineous apoplexy and was buried in the Carngham cemetery. Click here to read about the life and times of John Saunders and Sarah Wright and their family and descendants in Australia. After their marriage, Alfred John and Jane Elizabeth Cheeseman (pictured on the left) initially lived at Carngham where their first two children, Herbert Benjamin (1871-1938) and Sarah Jane Cheeseman (1872-1948), were born. During this time many squatters and other large land holders in New South Wales were in the process of fencing their land in order better to control their grazing stocks. Between 1871 and 1879, the overall length of NSW fences grew by a factor of 40 to around one and one quarter million kilometres. Large fencing contracts and steady wages were available for those willing to work hard. Alfred John took up the challenge and, between 1874 and 1877, was in charge of teams of men who were fencing off sections of the Riverina district around Wagga Wagga. Jane and her young family went with him and throughout this period were forced to live a harsh, isolated and nomadic life in which they constantly shifted from one temporary 'fencers' hut' to the next. According to a brief account of her life, published in the Ripon Shire Advocate in 1911, Jane Elizabeth and her young family encountered many great hardships. She has told us how on one occasion she was compelled to carry her sick child and walk a distance of 18 miles to secure medical aid, and on another occasion she found they had 'entertained an angel unawares' in the shape of a murderer fleeing from the police. On another occasion, Jane, another woman and their families were confronted by aboriginal bushrangers who demanded food and supplies. They gave them what little they had and were warned that if they informed on the escapees they would be punished. During this time, Alfred John and Jane had three more children: Christina Flora May (who was born at north Wagga Wagga in 1875 and died at Carngham from diptheria four years later), John Thomas (1876-1960) and Annie Agnes (1878-1944). 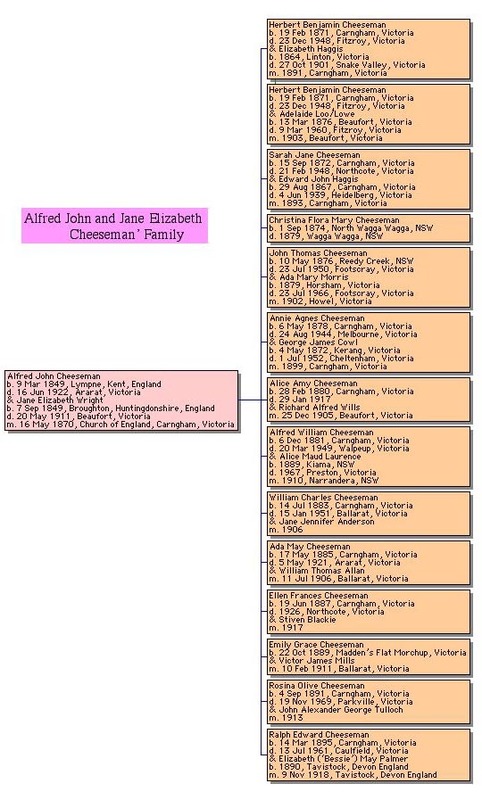 It is possible that Christina was named after the wife of John Cheeseman, a former convict who was then farming land at north Wagga Wagga and, we think, was Alfred's uncle. The family returned to Victoria in 1879 where they lived first at Carngham and then at Madden's Flat near Morchup and Mount Emu. It was here that Alfred John's mother, Jane Robinson nee Cheeseman nee Bass, who had returned to Carngham after the death of her second husband, Henry Robinson, died on 26 November 1888. Around 1893, Alfred John bought a small property (which he named Forest Farm) at Eurambeen near Beaufort. As the farm wasn't viable, Alfred had to supplement his earnings by working in the mines and cutting and selling firewood (sometimes he would go back to Mount Cole to burn wood for charcoal). During this time, he and Jane had a further eight children: Alice Amy (1880-1917), Alfred William (1882-1949), William Charles (1883-1951), Ada May (1885-1921), Ellen Frances (1887-1926), Emily Grace (1889-? ), Rosina Olive (1891-1969), and Ralph Edward Cheeseman (1895-1961), all of whom, together with their older siblings, are pictured in the photo below. 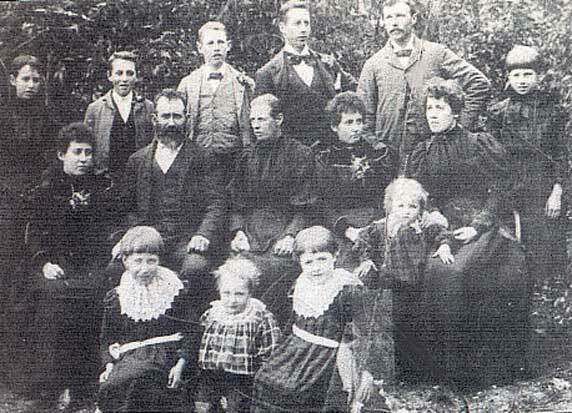 Alfred John and Jane Elizabeth Cheeseman and their family at Beaufort in around 1897. Jane Elizabeth, Sarah (holding her son Alfred Haggis), Annie, Emily, Ralph and Rosina. Victoria's 1899 census shows Alfred (a miner) and Jane (home duties) living at Beaufort together with their son John Thomas (a woodcutter). Their eldest son, Herbert Benjamin, was working at Snake Valley as a miner. The 1903 electoral roll shows Alfred (a miner) and Jane Elizabeth still at Beaufort along with Herbert and John (both working as labourers). The 1905 census lists at Beaufort: Alfred (miner), Jane (HD), Herbert Benjamin (labourer), Sarah Jane (HD), John Thomas (miner) and hus wife Ada Mary (nee Morris), Alfred William (miner) and William (labourer). By then the population of Beaufort was approaching 1000 and the town boasted in 'the way of societies, an agricultural society, athletics club, racing club, branch of the ANA, lodges of the order of Oddfellows, Rechabites, Good Templars and L.O.L. ; a Girls' Friendly Society, Ladies Relief Society, Volunteer Fire Brigade and a drum and fife band' (Ripon Shire Advocate, 18 June 1887). Although life over this period was probably easier than in the early days, it was not without its dangers, fears and tribulations. In April 1898 Alfred and Jane's son, John Thomas Cheeseman (who was 22 years old at the time), came down with typhoid fever. According to the doctor's report, published in the Ripon Shire Advocate, this arose because the premises on which he lived were 'insanitary owing to the fact that the bushes around [the home] served as closets for men around ... Cheeseman was in the habit of drinking water from holes in the bush and the supply for the family was obtained from holes in the Ding Dong Gully'. 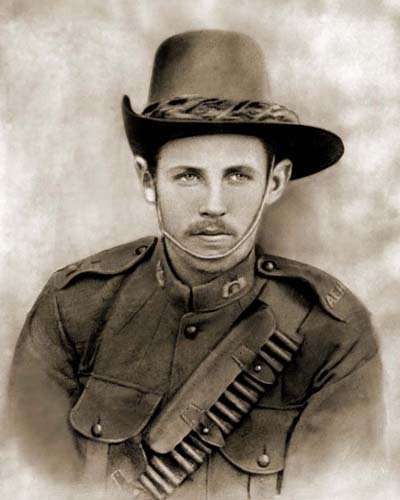 One of Alfred and Jane's sons, Alfred William, (pictured below) served in South Africa at the end of the Boer War and two other sons, William Charles and Ralph Edward (pictured on the left), left Beaufort in 1916 and 1915 respectively to serve in the First World War (in which one of their cousins, Walter Chibnall, who served with the 10th Light Trench Mortar Battery, was killed in action at Passchendaele). On another occasion, towards the end of his life and while visiting his son Alfred William's farm at Skipton, Alfred John's own house at Forest Farm was robbed and then burned down either as a result of a lightning strike or a bushfire which had been purposely lit. According to his granddaughter Christina ('Teen') Bainbridge nee Cheeseman, all he managed to salvage from the house were a framed picture of his mother, Clara Jane, a reading lamp and a large plate. Offsetting these trials and disappointments were other, much happier occasions. These included the 'old pioneers' night, held at the Mechanics Institute at Beaufort on 17 December 1910, at which Alfred and such other original settlers as J. B. Cochran, H. M. Stuart and W. C. Pedder, reminisced about the early days and were toasted - along with 'The King', 'Kindred Societies', and the Branch President of the Australian Natives Association - for their contributions to the life of the district. Other happy occasions were the marriages of the old couple's children to the offspring of other families and friends in the district. By the turn of the century three of their children had married, their eldest son Herbert Benjamin and eldest daughter, Sarah Jane, to brother and sister Elizabeth and Edward John Haggis, and a younger daughter, Annie Agnes, to a Melbourne jeweller, George James Cowl. Herbert Benjamin, who worked as a carpenter, and Elizabeth lived locally until the latter's death, from hydatids of the liver and acute peritonitis, at Snake Valley in 1901. We don't think they had any children. Two years later Herbert re-married, to Adelaide Lowe (1876-1960), the daughter of Tan Loo/Lowe and Jessica Bruce Buchanan from Dundee in Scotland. The electoral rolls show that Herbert and Adelaide moved away from Carngham, living at a number of places until Herbert's death in Melbourne in 1938 (Adelaide continued to live in Melbourne until her own death there in 1960). She and Herbert had five children we know of. Click here for more details of their life, times and family. Sarah Jane and Edward John Haggis (1867-1939) also left Carngham to live in Melbourne. They, too, had five children we are aware of, details of whom can be seen by clicking here. 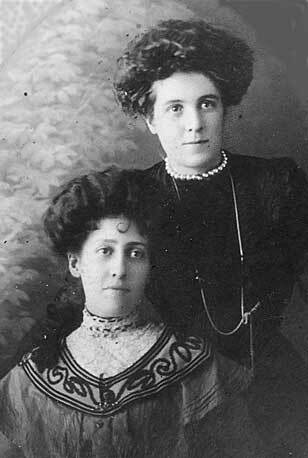 Herbert and Jane's younger sister, Annie Agnes (pictured on the right with her sister Alice Amy Cheeseman) married George James Cowl (1872-1952) at Carngahm in 1899, but lived all her married life in the Melbourne suburb of Hampton. She and George had three children. In the years leading up to the First World War seven more of Alfred and Jane's children married and left the family home. John Thomas married Ada Mary Morris (1880-1966), daughter of Thomas Morris and Ann Leslie, at Howel in Victoria in 1902. After living at Ballarat for a time they, too, moved to Melbourne where they lived initially at Richmond and later Footscray then Caulfield. They had three children we are aware of: 1) Clarence John Cheeseman (1903-79) who married Teresa Mary Wood (1920-2000) and had four children: Gary, Wanda, Warren and Cindy Cheeseman; 2) Alfreda Mary Cheeseman who was born at Beaufort in 1905 and died an infant; and 3) Leslie Morris Cheeseman (1910-75) who married Marion Campbell Johnston (1908-53), daughter of Thomas Johnston and Miriam Tasker, and had at least four children: Marianne, Susan, John Thomas and Robert Morris Cheeseman. John's younger sister Alice Amy (pictured on the left of the photo opposite) married Richard Alfred Wills (1878-1942) on Christmas day in 1905. The couple lived on a farm at Goorambat near Benalla where Alice died in 1917 aged just 36 years. They had three children: 1) Isobel Madeleine (1906-49) who married Doren Roland Kent (1899-1975); 2) Reginald Alfred (1908-72) who married Kathleen Mavis Bunworth; and Joyce Elizabeth Wills (1911-67). In 1904, William Charles had married Jane ('Jinnie') Anderson (1885-1969), the daughter of John Anderson and Elizabeth Tapp, at Beaufort where they continued to live after their marriage and where they had three children: Olive Jane, Ivan William and Dulcie Beryl Cheeseman. Around 1940 William nad Jane left Beaufort for Ballarat where William died in 1951. Click here to read more about, and see more photos of, William and Jinnie. William's sister, Ada May Cheeseman (1885-1921), married William Thomas Allan (1885-1957), the son of William Adam Allan (1847-1908) and Emily Pendigrass Bourke Ballantyne (1861-1921), at Ballarat in 1906. According to the Norton Family Tree on Ancestry William had five siblings: Violet Emily (1887-1973), Alexander Gordon (1889-1940), Elsie May (1891-1965), Ellis Norman (1893-1917) and Effie Evelyn Allan (1895-1981). The Australian electoral rolls show that after their marriage William and Ada lived at Ballarat where William was working as a miner. Shortly after this William began working for the Victorian Railways. In 1912 he and Ada were living at Miram, a rural village on the Melbourne to Adelaide railway line, some 10 km north-east of Kaniva in the northern Wimmera. They were at Stavely (near Wickcliffe) in central Victoria at the time of the 1914 and 1919 elections. Ada died at Ararat in 1921 leaving William to bring up their two boys, Jack and William Alexander ('Alec') Allan. The electoral rolls show him at Gheringhap (located just west of Geelong) in 1924 and in Geelong itself in 1931 along with a Grace Isabell Allan. This was William's second wife, Grace Isabella Turner (1893-1981), the daughter of Charles Edwin Turner and Isabella Black. In 1936/7 William and Grace were living at 62 Elphin Street in the Melbourne suburb of Newport. Sometime during the war years they relocated to Wangaratta where they would spend the rest of their lives. The electoral rolls show they had living with them in Wangaratta in 1949 a Loris Isobel Allan, typist, and in 1954, Norman Ellis Allan, a motor mechanic. The Billion Graves website shows that both William (who died on 2 April 1957, aged 71 years) and Grace (who died 1 October 1981, aged 88 years) are buried together in the Wangaratta cemetery. What of William and Ada's two boys? 1) Jack Allan (1908-84). Born at Ballarat East, Jack, who was then working for the railways, married Mona Caroline Duff (1910-2003), the daughter of Andrew Duff and Clara McCabe, at Geelong in 1931. The 1937 electoral roll has them at Bena near Wonthaggi. They spent the war years and after back at Geelong where, by 1949, Jack had left the railways and was working as a fruiterer while Mona was a greengrocer. By 1954 they had moved to Dooen near Horsham where Jack was the local hotel keeper. They both died and were buried at Horsham, Jack in 1984 and Mona in 2003. The Kane and Dolman Family Tree on Ancestry tells us Jack and Mona had one child, still living. This is supported by information sent to us by Jenny Tapungao suggesting they had a daughter (possibly named Varerie) who they think may have married someone named Brown. Click here to see some photos of Jack and Mona. 2) William Alexander ('Alec') Allan (1911-93). Born at Kaniva, Alec married Gwendoline Mary McCullagh in 1933. The 1936 electoral roll shows William, a railway employee, and Gwendoline living at Kiata near Nhill in Victoria. In 1937 they were at Glenloth near Wycheproof. The Department of Veterans Affairs' WW2 nominal roll shows that 42243 William Alexander Allan, born at Kaniva on 11 February 1911, enlisted in the RAAF at Melbourne on 11 February 1941 (he was then living at Glenloth and gave as his NOK Gwendoline Allan). He was discharged on 7 June 1943 while serving as a Leading Aircraftman at 1 Embarkation Depot at Ascot Vale. He had earlier enlisted in the Army and was discharged on 3 August 1941 as a trooper in the 24th Machine Gun Regiment. Gwendoline lived in the Melbourne suburb of Footscray during the war. The 1949 electoral roll shows she and Alec, an archardist, at Kyabram together with an Irene Alice Allan. The 1958 roll has Alec, working as an agent, and Gwendoline at 35 Harfleur Street in Deliliquin in NSW. The Deniliquin Genealogical Society Website tells us Gwendoline and Alec both died at Deniliquin and are memorialised in the Deniliquin Memorial Cemetery (no dates provided). Information sent to us by Jenny Tapungao tells us they had three children: 1) Desmond John Allan who married Deanna Dorothy McLeary and had five children: Deborah Ann, Deadre Jane; Peter John, Ian Desmond and Marine Dianna Allan; 2) Barry Maxwell Allan who married Beverley Joyce Lean in 1964 and had three children: Dean Alexander, Nichole Joy and Amanda Lea Allan; and 3) Geoffrey Douglas Allan who married Joyce Lorraine Brenthall in 1970 and has three children: Rondi Dionne, Bret Thomas and Honni Alexandra Allan. In 1910 Alfred William (pictured on the left) married Alice Maud Laurence (1889-1967), the daughter of William Joseph Laurence and Mary Jane Kersley, at Narrandera in New South Wales. As described above Alfred had gone to South Africa with the Australian Commonwealth Horse. When he returned home he found that work around Carngham was scarce and so he and his brother Herbert Cheeseman travelled north into the Riverina district of NSW where they were contracted to sink wells for bore water. It was during this time that Alfred met his future wife Alice Maud Laurence. According to Alfred's son Laurie Cheeseman's memoirs, Alice was employed as a domestic servant at the 'Bynya' station to the east of Griffith and had walked down to a well they had just dug to fetch some water. They continued to write to each other after Alfred and Herbert moved on and, much to the consternation of Alice's employers at Binya, she eventually agreed to marry the tall Victorian. After their wedding Alfred and Alice lived initially on a small property near Beaufort in Victoria. Life there was not easy and Alfred was forced to look for other work in order to support his family. This meant he was away from home for much of the time and Alice was left to do the work around the house as well as look after her two young children, Alice Winifred or 'Winnie' (born in 1911 and named after the sister of the Bynya station's manager) and Christina Mary or 'Teen' (born at Beaufort in 1913). During this time Alfred John and his youngest son Ralph would often visit the property to see that Alice and her young family were all right and take them into town to shop or see the sights. In around 1919 Alfred William and Alice moved from Beaufort onto a farm at nearby Skipton. As their daughter Winnie recalled they would still visit Alfred's family at Beaufort on weekends and go to whatever entertainment the town offered. Winnie added that her parents 'loved these weekends, there was always so much fun at Bill and Jinny's, they had three children, just a small house, but Auntie Jinny could make a comfortable bed on the floor and she was a wonderful cook'. In 1927 Alfred and Alice and their family moved from Skipton onto a farm near Walpeup in Victoria's Mallee district. Life there was much harder with much less opportunity to visit their friends and relatives at Beaufort. Alfred William died at Walpeup in 1949. 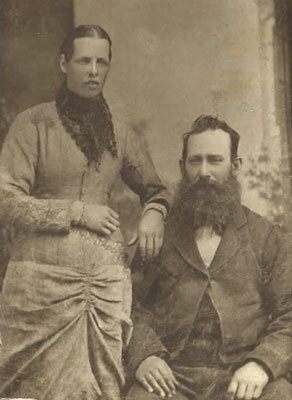 Alice and her younger sons initially stayed on the farm but eventually sold up and Alice and her youngest son, Alfred or 'Freddie', went to live at Ouyen. Click here to read and see more about the lives and family of Alice and Alfred William. We regret having to record the death of Mrs Jane Elizabeth Cheeseman, the wife of Mr Alfred John Cheeseman, of Beaufort, the sad event occuring on Thursday evening, at the residence of her daughter, Mrs E. Haggis. Deceased had suffered for about two years from chronic Bright's disease and chronic valvular heart disease, and for two days prior to her death from apoplexy and coma. She was a native of Huntington, England but came to Victoria when two years of age with her parents, the late Mr and Mrs John Wright of Carngham. She was married at the age of 20 years at Carngham, and has a family of five sons and eight daughters, all of whom are living except one daughter. The eldest son, Mr Herbert John Cheeseman, resides in Melbourne, as also does a married daughter, Mrs Cowl. Other daughters, Mrs Mills and Mrs Allen live at Warburton Gippsland and Miriam near Serviceton, respectively. Deceased who was esteemed for her many good qualities, had reached the age of 61 years, 17 of which had been spent in Beaufort. In addition to the bereaved husband and family (ranging from 40 to 16 years of age), deceased leaves 20 grandchildren to mourn her loss. 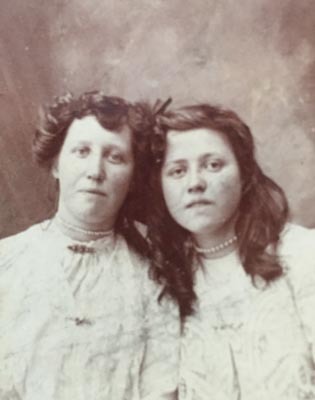 One of William's sisters, Emily Grace (pictured on the left of the photo below of her and her younger sister Rosina Olive) married Victor James Mills at Frankston on the outskirts of Melbourne in 1911. She and Victor had two boys - Victor Campbell and John Henry Charles Mills - before Victor senior enlisted in the First AIF and departed for overseas service (some in the family think that Emily may also have had a daughter, Sheila Grace Cheeseman, who was born after the war). According to his military record, Victor served as a private soldier in the 7th Battalion. Emily's niece, Christina ('Teen') Bainbridge nee Cheeseman tells us that Emily and her two boys lived with Emily's family at Beaufort during all the war years. 'When the war ended, they received a letter from Ralph [Emily's brother] saying the ship he was coming home on contained Victor Mills and that it was "a pity he was coming when so many better men would never come again". When that letter arrived', Teen continues, 'Emily took the boys to his mother's in Ballarat and left them there'. It seems she feared resuming her life with Victor and saw leaving him as her only way out of 'a bad marriage'. The real shame was that her decision also led her to be separated from, and ostracised by, her own loving family. 'Aunty Ada was the last of the family to see her, long after we went to the Mallee, Ada just shut the door on her, said she was with an Army officer and was well dressed'. As the bridal party entered the church the bridal hymn was sung by the choir. The groom was supported by Mr Ralph Cheeseman as best man and Mr George Krick as groomsman. The bride who looked charming and was given away by her father, and attended by the Misses Nellie Cheeseman and Mary Tulloch as bridesmaids was attired in a lovely gown of ivory silk muslin ... She wore the usual wreath and veil and a handsome chain bangle, the gift of the bridegroom, and carried a striking bouquet of scotch heath ... [After the wedding ceremony] Mr Cheeseman entertained a numerous company of guests at the wedding breakfast and subsequent social evening at the Societies Hall where toasts were drunk and hearty congratulations given and acknowledged amid much good natured merriment. The travelling dress was a saxe blue coat and skirt, tugel hat trimmed with white marguerites. Presents were numerous and costly. Rose and John lived away from Beaufort after their marriage, initially in the Melbourne suburb of Richmond, where John worked as a police constable, then Warburton in Gippland and finally at Alexandra near Lake Eildon in central Victoria where John died in 1936. According to his death notice published in the Alexandra and Yea Standard on Friday 24 July 1936, he was aged 46 years, 'was formerly employed at the mills in Rubicon Forest, and had been in ill-health for some time. He leaves a wife and family of two'. The electoral rolls show that after John's death, Rose moved back to Melbourne where she lived - for a time at Richmond and later Sunshine in Melbourne's west - until her own death in 1969. Her ashes are interred in the Rose Garden of the Altona Memorial Park Cemetery. Rose and John had one daughter and one son who, as detailed below, have provided them with five grandchildren, 13 great grandchildren and at least 21 great great grandchildren. 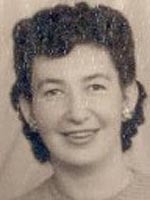 1) Annie Jean Elizabeth Tulloch (1915-97) who was born at Richmond in Melbourne and married Albert Ernest Brown in 1936. The electoral rolls show they were living at Alexandra in the late 1930s. Annie's granddaughter, Jenny Tapungao, tells us she and Albert had four children: 1) James Albert Brown who married Aileen Margaret Hill in 1959 and has three children and five grandchildren; 2) Vivian Albert ('Viv') Brown who married Jean Blakeley Paterson in 1958 and has three children and six grandchildren; 3) Fay Elizabeth Brown - Jenny's mother - who married Barry James Murrihy (1942-2007) in 1966 and has three children and eight grandchildren; and 4) Jill Yvonne Brown who married Colin McCrae Bish and has two children. 2) John Alexander James Tulloch (1919-82). Born at Daylesford in central Victoria in 1919, John was living with his mother in Melbourne in 1940 when he enlisted in the Australian Army. The Department of Veterans Affairs' Nominal Roll for World War 2 tells us he served as a gunner in the 2nd Medium Artillery Regiment but has no details of where he served or when he was discharged. The 1942 electoral roll shows John, a railway employee, living at 21 Charlotte Street in Richmond with his mother. The 1949 roll has him as an assistant station master at Tallygaroopna near Shepparton in Victoria. Also registered there was a Pearl Joyce Tulloch. They were both living c/- Railway Station at Tynong near Pakenham at the time of the 1954 election and Yarragon in 1963 and 1968 (John was the stationmaster there). The 1972 roll has them at 14 Loch Street in Yarragon together with a Janice Joy Tulloch, teacher. By the time of the 1977 election John, who was now an inspector, and Pearl had moved to Melbourne and were living at 7/39 Zetland Road Mount Albert. They were both still there in 1980. John died two years later presumably in Melbourne although that has still to be confirmed. Jenny Tapungao tells us they had only one child, Janice Joy Tulloch who married Brian Gaffey in 1972 and has two children and two grandchildren. Click here to see more photos of Rose and John and their family and relatives. In 1917 Rosina's sister, Ellen ('Nellie') Frances, married Stiven Blackie (1872-1945) at Moonee Ponds in Melbourne. Their marriage certificate shows that Stiven was a 44 year-old railway ganger who was born at Ballarat but was then living at Horsham. Ellen was then living at 93 Green St at Richmond in Melbourne although her usual address was Forest Farm at Beaufort. The marriage was witnessed by Lily Miller Scott and Ernest Robert Campbell. Stiven's parents were James Carnegie Blackie (1830-82), an engineer, and Eliza Larmour Campbell (1842-1930). According to his obituary published in The Ballarat Star on 17 May 1882, James had worked for 'the Gravel Pits Company, the Britannia Company at Carngham, the Wombat Hill at Daylesford, and several other companies. He was also a partner of Vallence, Quayle, and Blackie, contractors for the section of railway built from Buangor to Ararat. For the past seven years he had filled the position of engineer at Ararat at which place be was suddenly taken ill, and died on Sunday evening last, leaving a wife and 10 children not well provided for'. Four of James and Eliza's sons worked for the Victorian Railways. Stiven spent over 25 years with the Way and Works Branch, eventually rising to Works Ganger at Ballarat. His military record in the National Archives shows he sought to enlist in the Australian Army at Ararat on 5 February 1916 but was unsuccessful because of a stiff knee. 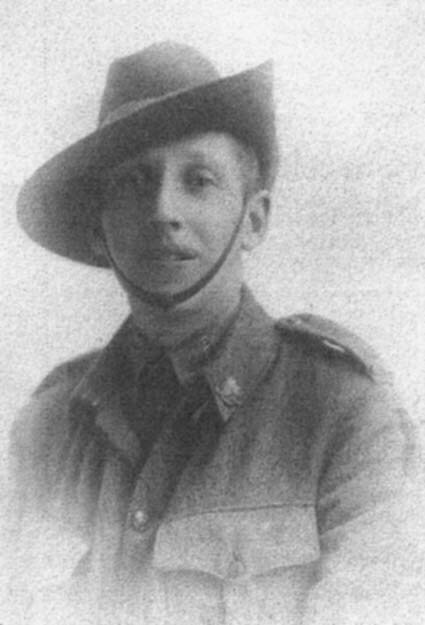 His younger brother, Norman Campbell Blackie, who worked as a clerk in the Victorian Railways, enlisted on 22 December 1916 and was allocated to 2 Section Australian Railway. He sailed on the HMT BALLARAT from Australia to Devonport in England and thence to France. On 21 November 1917 he was promoted from Sgt to WO2 and made CSM of the 1st Light Railway Operating Company. In 1919 he spent time in a military hospital at Fulham before returning to Australia on the CERAMIC on 12 March 1920. On 30 January 1929, Norman married Lilian Stewart (Olive) Dawe, only daughter of Mrs and the late Reverend J. H. Dawe of Warragul (apparently the Rev Dawe and Stiven and Norman's father attended the same school). The Australian electoral rolls show that after their marriage, Stiven and Nellie lived at Bruthven in Gippsland before moving to Ballarat in central Victoria. She died at Northcote in Melbourne on 21 March 1926 from the effects of breast cancer (she was probably staying with her older sister Jane Haggis nee Cheeseman). Her death certificate states she was then 38 years old and normally resided at 15 Windamere Street in Ballarat. The informant was her husband Stiven who was present at the death. Ellen was buried at the Fawkner cemetery in Melbourne the following day. Her death notice, published in the Melbourne Argus on 22 March 1926 read: 'BLACKIE - On 21 March at 18 St David Street Northcote, Ellen Frances, the dearly loved wife of Stiven Blackie, 15 Windamere Street south Ballarat and loving mother of Ralph Carnegie, beloved daughter of the late Alfred John and Elizabeth Jane Cheeseman, of Beaufort, aged 38 years'. The 1931 and 1936 electoral rolls show Stiven living at 15 Windamere Street in Ballarat with his sister Martha Mary Blackie. As the following report in the Melbourne Age describes, in that same year he was involved in serious work accident: 'Substantial improvement was shown on Thursday by Stephen Blackie, 60 years, of 15 Windermere-street, railway ganger, and Roy Elliott, 37 years, of 4 Pleasant-street, platelayer, who were concerned in the level-crossing accident near Lethebridge on Wednesday evening. Blackie is suffering from a probable fracture of the leg and Elliott from a broken arm. With four other railway men, they were riding on a trolley, which struck a motor truck driven by Mr. H. O'Connor, of Meredith, which passed over the railway track at the crossing. The other railway men escaped with minor abrasions'. Stiven survived the accident and continued to live and work at Ararat until his death there in 1945: 'BLACKIE - On April 4, at Ararat, Stiven, beloved husband of the late Ellen, and loved father of Ralph, son of the late James and Eliza Blackie and brother of James (deceased), John (dec), William (dec), David, Alex, Elizabeth, Martha (dec), Charles and Norman, aged 72 years' (Argus, 7 April 1945). As Stiven and Nellie's death notices indicate, they had only one child: Ralph Carnegie Blackie (1918-76). Born at Horsham, Ralph enlisted in the Australian Army at Ballarat on 4 August 1940. He was then living at Ballarat and gave as his NOK Elizabeth Blackie. He was discharged on 4 April 1946 at which time he was a Sergeant in the 12 Aust Lt Laundry. The 1949 electoral roll shows Ralph, a process worker, living at 15 Windamere Street in Ballarat along with William Robert, Margaret Irene and Isobel Christina Blackie. William was Ralph's uncle and Isobel Christina his wife who he had married in 1946 (the photo on the right is of Isobel probably on her wedding day although we have not yet confirmed that). Born at Stawell in Victoria in 1919, she was the daughter of Ernest Samuel Pickering (1887-1968) and Annabella Mary Cameron (1888-1974). At the time of the 1954 election Ralph, a storekeeper, and Isobel were at 1217 Howitt Street in Learmonth near Ballarat. The 1963 roll has Ralph, a plumber, and Isobel, psychiatric nurse, at 4 Barkly Street in Ararat. They were registered at 84 High Street Ararat in 1967 (Isobel was designated as home duties) and back at Barkly Street in 1968 and 1972 (Ralph was then working as a male nurse). The 'medfam050709' family tree on Ancestry tells us that Ralph died of heart failure at Ballarat on 1 August 1976 and was buried at the Ararat Cemetery. He was working as a male nurse at the time of his death. His wife, Isobel Christina was said to have died on 13 January 1996 although that has not been confirmed. An entry for Isobel on the 'My Heritage' website - which contained the photo of her shown on the right - tells us that she and Ralph had three children, one of whom would have had to have been the Stiven Carnegie Blackie pictured in the photo below (the DVA's nominal roll for the Vietnam War shows that Stiven, who was born at Ballarat on 22 November 1949, was a national serviceman who served in the Royal Australian Army Medical Corps in Vietnam between March and October 1971, initially at HQ 1ATF and then with the 8th Field Ambulance). 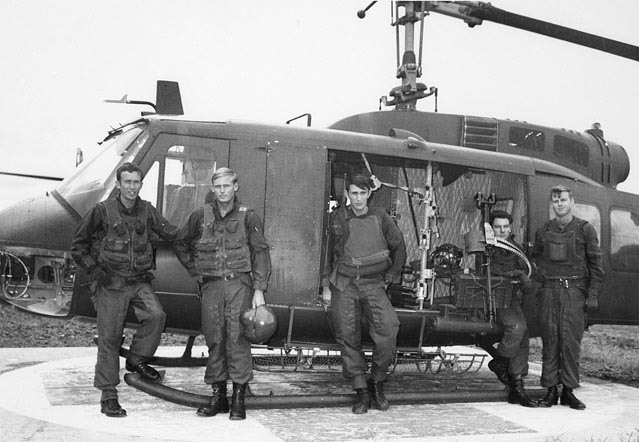 Royal Australian Medical Corps (seated in the centre) a member of a medevac team operated by the RAAF's 9 Squadron. The photo was taken at Nui Dat in the Phuoc Tuy Province of South Vietnam sometime between August and October 1971. Finally in 1918 Ralph Edward sent news from England that he had married Elizabeth ('Bessie') May Palmer on her parents farm at Tavistock in Devon. Ralph, who described himself as a grazier, had met Bessie while he was recuperating from wounds received on the western front. The wedding was attended by Ralph's older brother William Charles, Bessie's parents, and her best friend May who had helped her nurse the wounded during the war. The death occurred in the Ararat hospital, on Thursday, from an internal complaint of Mr Alfred Cheeseman who was about 70 years of age. Deceased was a respected resident of Beaufort for many years before returning to Skipton. His wife pre-deceased him eleven years ago and he leaves a large family of grown-up sons and daughters. One of the sons is Mr Wm Cheeseman, Lake Goldsmith and two others (Messrs Fred and Ralph Cheeseman) reside at Skipton. The remains of the deceased are to be interred at Beaufort ... 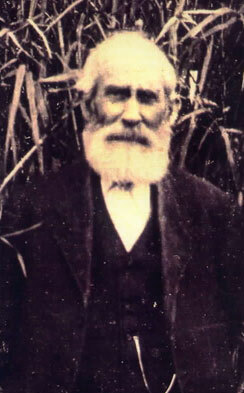 The late Mr Cheeseman was at the Ararat diggings with his parents and later the family went to Carngham to reside. [He] had a family of five sons and eight daughters three of whom (together with their mother) pre-deceased him. The remains of the deceased were interred at the Beaufort cemetery on Saturday, the funeral being attended by many old friends of the family. The coffin (which was of polished wood and silver mountings, and was covered with beautiful floral tributes of sympathy, was borne to the grave by Messrs Wm Allen, S. Blackie (son-in-law), W. Chibnall and M. Dames (Brothers-in-law). The pall bearers were Messes J.A.W. and R. Cheeseman (sons), J. Wright, J.T. Glover, W. Shaw and W. Stokes (nephews). Cheeseman family at Beaufort c1897, Annie and Alice Cheeseman, Ralph Cheesema                                                                                                                                                                                                                                                                                                                                                                                                                                                                                                                                                                                                                                                                                                                                 n and Alfred William Cheeseman, private collection. Jane Elizabeth and Alfred John Cheeseman and Alfred John as an old man, courtesy of Sue taylor (nee Cheeseman). Emily Grace and Rosina Olive Cheeseman, courtesy of Jenny Tapungao. Isobel Christina Blackie nee Pickering from the 'My Heritage' website.